Your dog is part of the family – why wouldn’t you take them on the road with you if you could? A road trip can be a fantastic experience for you and your pup if done correctly. Below are Paw Commons Pet Resort’s most highly recommended gadgets, gizmos and contraptions to make your road trip with your dog a great success! 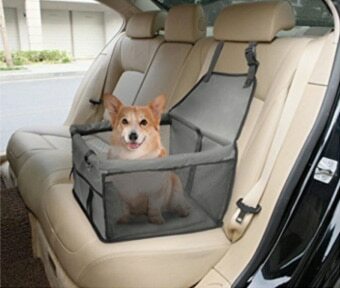 A booster seat is a great way to make sure your four-legged friend isn’t running around loose in your moving vehicle! While this one here only holds dogs up to 25 lbs, there are plenty of options for larger pups as well. If you’re worried your dog might have too much energy for a long car ride, bring him by Paw Commons located in San Diego, Encinitas or Gilbert in Arizona for a few hours of doggy daycare! A tired pup is a great companion during long car rides! 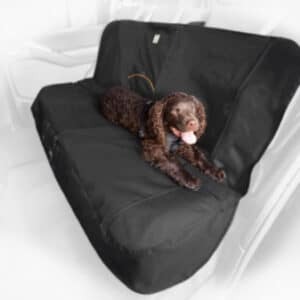 For larger and furrier dogs, this bench seat cover is a great way to keep your car clean and hair-free. Whether your destination is the beach, the trails, the desert, or any other terrain, with this seat cover your car will look like it’s been in the garage all weekend! Want to go the extra mile to making sure your car remains spotless? Sign your dog up for a grooming service at Paw Commons San Diego, Encinitas or Gilbert to make sure your pup is squeaky clean before he even sets paw in your vehicle! All of our locations sell a variety of grooming tools as well, so if you would like to keep them silky smooth and clean, come by and pick some up beforehand! Worried about feeding and watering your pup on the go? 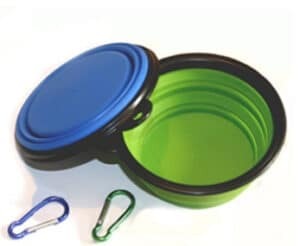 With these great portable, collapsible food and water bowls, that won’t be a problem! Make sure you’re amply stocked for the upcoming road trip by stopping by any Paw Commons location and picking up some dog food and treats! Our Taste of the Wild is a great premium dog food, and select locations also carry Stella & Chewy’s and RAWZ raw dog food. If your road trip is not long enough for meals, any treats and toys from our retail department should be more than enough to keep your pooch occupied for a few hours! Lastly, where in the world are you going to keep all of your dog’s travel accessories? 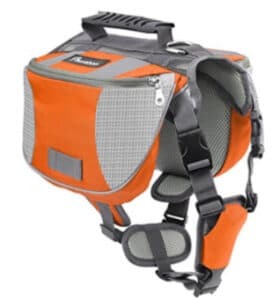 This hiking backpack is a great way for your dog to carry all of his belongings without weighing you down. A dog with a job is a happy dog! That being said, packing up yours and your pooch’s belongings may stress him/her out. They don’t know that you’re going on a fabulous adventure together! To give you and Fido some piece of mind, call Paw Commons San Diego, Encinitas or Gilbert to schedule an overnight stay for him. That way, he can romp around with their four-legged friends and our staff without a care in the world.Still have questions? Feel free to stop by our retail sections at any Paw Commons Pet Resort – we can answer any questions or concerns that you might have about taking your pooch with you on the go!